Wire Frames was a month long project whilst on exchange in OCAD, Toronto. The brief was to design a typeface based on the work of an artist or designer. I chose German artist Thomas Raschke who creates intricate sculptures from wire. He studies and replicates banal objects, ending up with an interesting body of work that resemble intricate 3D wire blueprints. I find this an intriguing aspect to his work, and chose to use Baskerville majuscules as the structure of my typeface as I feel Baskerville is overlooked in both its form and aesthetics, much like the objects Rashcke bases his sculptures on. The letters are made in the metal workshop, bending the wire by hand and joined by spot welding. Each letter is 4" in height, sanded and sprayed black to finish. Rashcke exhibits his work in clean white spaces, casting subtle shadows of his sculptures which both highlight and compliment his pieces. By hanging my typeface on the wall I was able to mimic the shadows that occur in Raschke's exhibitions. 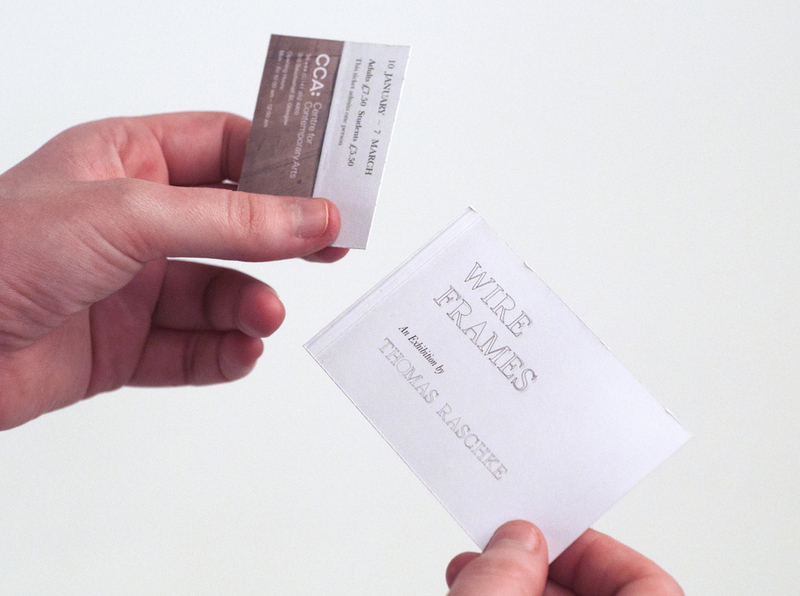 I then developed this project further, using the typeface to create a fictional exhibition at the CCA, Glasgow. Keeping the poster purely typographic by using my wire letters and other fonts in the Baskerville family ties the whole project together. The tickets are printed and perforated so when people enter the exhibition, the floor is ripped off and they get to keep the wire frames exhibition title as memorabilia. Photographs showing the development of this project, taken with my 35mm film Pentax ME Super.